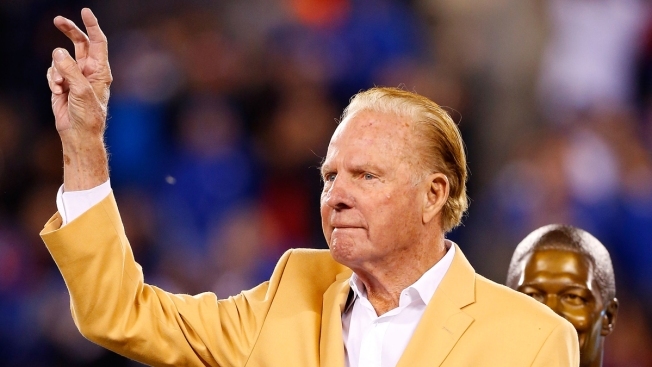 Hall of Famer Frank Gifford is introduced during a halftime ceremony of a game between the New York Giants and the Indianapolis Colts on November 3, 2014 at MetLife Stadium in East Rutherford, New Jersey. NFL legend Frank Gifford, who died in August, had brain damage that's been associated with playing football and other high-impact sports, his family said Wednesday. Gifford's family said he suffered from chronic traumatic encephalopathy, or CTE, which brain researchers have linked to repeated concussions. "We decided to disclose our loved one’s condition to honor Frank’s legacy of promoting player safety dating back to his involvement in the formation of the NFL Players Association in the 1950s," his family said in a statement. A Hall-of-Fame player who led the New York Giants to the 1956 championship, Gifford was later a highly regarded broadcaster on "Monday Night Football." He died Sunday, August 9, at 84. Gifford's family – which includes "Today" host Kathie Lee Gifford – said they suspected he was "suffering from the debilitating effects of head trauma," and that a team of pathologists confirmed his diagnosis. He died of natural causes, the family said. "We as a family made the difficult decision to have his brain studied in hopes of contributing to the advancement of medical research concerning the link between football and traumatic brain injury," the statement said. He took a long break from football after a crushing hit in November 1960 that left him unconscious. Flattened by 233-pound Eagles linebacker Chuck Bednarik, Gifford was hospitalized for 10 days and didn't return to the game until 1962. Bednarik's celebtration over Gifford, immortalized in a photo, was thought to be over the top. Gifford later hosted "Wide World of Sports," covered several Olympics — his call of Franz Klammer's downhill gold medal run in 1976 is considered a broadcasting masterpiece — and announced 588 consecutive NFL games for ABC, not even taking time off after the death of his mother shortly before a broadcast in 1986. The Associated Press and NBC San Diego's Derek Togerson contributed to this report. 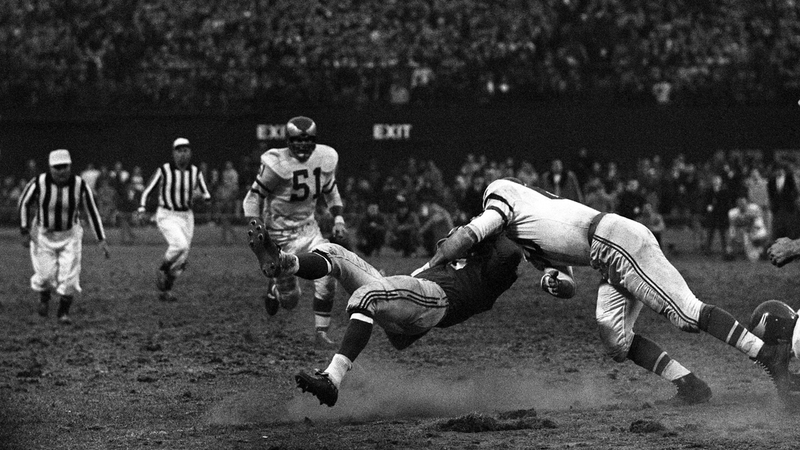 Linebacker Chuck Bednarik #60 (right), of the Philadelphia Eagles, hits Frank Gifford #16 (center), of the New York Giants, to stop the last chance the Giants had of coming back and tying the score during a game on November 20, 1960 at Yankee Stadium in New York, New York. Gifford was knocked unconscious and taken from the field as the Eagles beat the Giants, 17-10.